Dr. Sean Beeson, DO is joining with his wife, Dr. Sarah Beeson, to serve patients in the new Johnson Memorial Health Greenwood Primary Care Center. Dr. Beeson is a graduate of the University of Pikeville-Kentucky College of Osteopathic Medicine and received his Master's of Science in Medical Education from Lake Erie College of Osteopathic Medicine. He also earned a Bachelor's of Biology and Chemistry from Franklin College in Franklin, IN. He is Board Certified in Family Medicine and completed his residency at Millcreek Community Hospital in Erie, PA. While serving as Co-Chief Resident at Millcreek, he was responsible for teaching and supervising medical students and interns, leading monthly physical diagnosis workshops, participating in research projects and giving medical lectures. 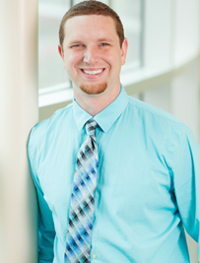 An Alpha Honor Society member at Franklin College, Dr. Beeson participated in a gene sequence analysis project. He is a member of the American Academy of Family Physicians, the American College Osteopathic Family Physicians, the American Osteopathic Association and the National Multiple Sclerosis Society. Locally, Dr. Beeson tutors students at Franklin College, is a volunteer for the SERTOMA Club of Greenwood WAMM Fest and a first grade volunteer at Westwood Elementary School in Greenwood. He participates in triathlons and trains dogs.